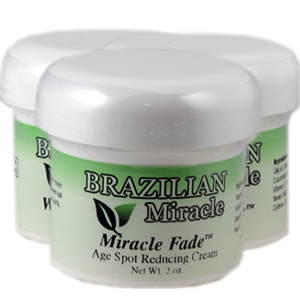 Miracle Fade is a safe effective Age Spot Treatment for skin discolorations, freckles and liver spots. 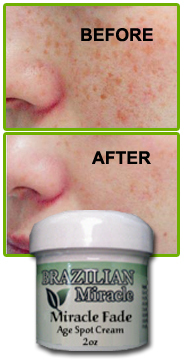 Suffering from age spots, freckles or dark spots on your skin? Then you know how difficult it can be to cover up or get rid of them. Well you don’t have to deal with blotchy uneven skin or dark spots any more. 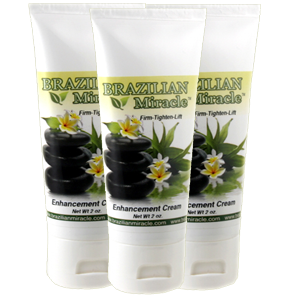 Miracle Fade from Brazilian Miracle has an exclusive formula made with Pearl Powder that has been used in the orient for centuries. 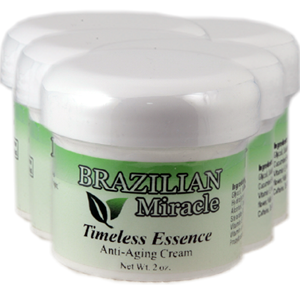 Miracle Fade Age Spot cream is the strongest yet gentle skin lightening treatment available without a prescription. You can now quickly and safely rid your complexion of unsightly age spots, freckles and even reverse damage caused by sunlight. Pearl powder, The active ingredient in Miracle Fade has been used for centuries by ancient and modern Asian cultures as a whitening agent for discolored or dark skin. Miracle Fade will start treating stubborn skin discoloration and age spots in just days. 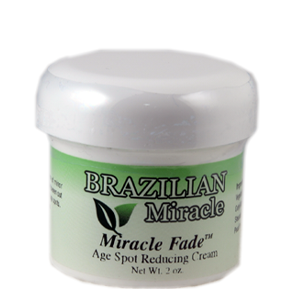 Miracle Fade Age Spot Treatment diminishes skin discoloration common on sun damaged or aging skin. Now you can magically erase age spots, sun damage (solar lentigines) freckles, and other unwanted dark or un even skin pigmentation without cosmetic surgery or harsh chemicals. Miracle Fade is a clinically proven, gentle yet highly effective treatment that fades stubborn skin spots fast, while improving skin texture and tone. Daily use of Miracle fade will to give you a beautiful even complexion free from age spots and erase pigment damage caused by sun exposure and aging. Age spots can occur for many reasons other than age including damage by UV rays. Getting age spots is common Even if a person takes care of their skin, ageing skin will still lead to age spots.